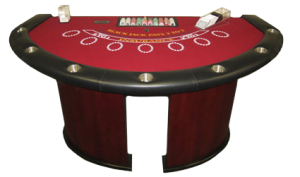 Call Casino Party Planners at 317-857-0168 for your next casino party event or fundraiser and reserve your casino equipment today.We have lots of rentals for your casino party including craps tables, blackjack tables, poker tables, roulette tables and much more casino equipment available. Check out our “Party Extras” page to see all of our décor and specialty items that can really make your next event spectacular. And of course, our Casino Equipment and rentals can be staffed by our dedicated professional team of dealers who will provide your guests with an experience to remember. You can make this more than just an event, we can make it a memory! All of our Poker Tables are 98” inches and are the same size and style of equipment that is used in casino poker rooms around the world. It is also the same size as the one used on the Travel Channel and ESPN for their televised Texas Hold’em Poker tournaments! This is a Full Size Blackjack Table identical in almost every way to what you would find in almost any casino throughout the world. Each table can accommodate up to 7 Player Positions plus the Dealer. Each table features Wooden curved ¼ moon arched Legs and a Wood Reinforced Exterior Frame – Size 76”W x 36”H x 48″ deep along with black vinyl padded armrests for the players comfort. This is a Full Size Let it Ride Table identical in almost every way to what you would find in almost any casino throughout the world. Each table can accommodate up to 7 Player Positions plus the Dealer. Each table features Wooden curved ¼ moon arched Legs and a Wood Reinforced Exterior Frame – Size 76”W x 36”H x 48″ deep along with black vinyl padded armrests for the players comfort. If you know the basics of five-card stud poker, you’ll fit right in at the Caribbean Stud Poker table. Just remember that you’re playing against the Dealer, not the other Players, so you don’t have to worry about figuring out everyone else’s strategy. This is a Full Size Caribbean Stud Table identical in almost every way to what you would find in almost any casino throughout the world. Each table can accommodate up to 7 Player Positions plus the Dealer. Each table features Wooden curved ¼ moon arched Legs and a Wood Reinforced Exterior Frame – Size 76”W x 36”H x 48″ deep along with black vinyl padded armrests for the players comfort. This is a Full Size Three Card Poker Table identical in almost every way to what you would find in almost any casino throughout the world. Each table can accommodate up to 7 Player Positions plus the Dealer. Each table features Wooden curved ¼ moon arched Legs and a Wood Reinforced Exterior Frame – Size 76”W x 36”H x 48″ deep along with black vinyl padded armrests for the players comfort.